Contrast that to what’s been happening in the Denver sports world for nearly three weeks. Ever since Brock Osweiler bolted Broncos Country, deciding he had a better chance for success with a franchise that has won a grand total of two postseason games during its 13-year existence (none over a team not named the Bengals) than with the defending Super Bowl champions, a debate has raged over who should be the heir apparent to Peyton Manning in the Mile High City. Almost everyone has an opinion on the matter, chiming in to play armchair general manager and tell John Elway how he should rectify the team’s situation at the most-important position in all of sports. This has led to plenty of spirited debates around town, with sports talk phone lines lighting up, responses to columns and blogs hitting a fever pitch and every bar in town becoming a pseudo NFL war room for conversations about Denver’s best QB option. For awhile, these arguments were fun; it gave everyone something to talk about while the Nuggets played out the year, the Avalanche limped to the finish line and the Rockies prepped in relative anonymity in Arizona for what promises to be another bleak season. But eventually, the debates became tiresome; not so much because they went on and on, day after day, but due to the fact that the positions taken by some of the commenters were so preposterous. At this point, most of the discussions surround four options for the 2016 season: Ryan Fitzpatrick, Colin Kaepernick, Mark Sanchez and a TBD rookie. 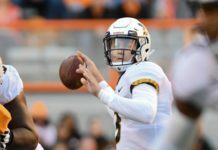 Some people like to throw Trevor Siemian into the mix, claiming that the Broncos coaches like what they saw out of the young QB during his limited action last preseason; of course, this is the same group that spent a lot of time telling everyone how much Denver’s brass like Zac Dysert a year or two ago. So for those with some sense of reality, there are four viable candidates to be behind center when the Broncos take the field on Sept. 8 to begin defense of their Super Bowl title. But to any objective observer, there really is only one option that makes any sense. Sanchez certainly endeared himself to the Denver fan base during his introductory press conference, saying all the right things when he met the media after being acquired in a trade with the Eagles. But playing quarterback in the NFL is about more than providing the local scribes with good copy; at the end of the day, it’s about being able to handle the demands of the position. During his seven-year NFL career, which has spanned two teams and multiple offensive coaches, Sanchez has proven to be nothing more than mediocre; his 37-35 career record as a starter is the best evidence of that fact. But completing only 56.7 percent of his passes is further evidence, as is a stat line that shows 86 touchdowns and 84 interceptions; it’s hard to be any more so-so than those numbers. This far-from-stellar résumé is why T.J. Ward was less than enthusiastic about the newest Broncos quarterback during an interview last week on NFL Network. “Right now, I think we have Mark Sanchez signed and, um, he… has some experience in this league,” the Broncos safety said with a chuckle. That pretty much sums up Sanchez’s candidacy for the job. Which leads to veteran QB option No. 2 – Fitzpatrick. Coming off of a solid season in New York, where he led the Jets to a 10-6 record by throwing for 3,905 yards and 31 touchdowns, the 33-year-old signal caller is looking for the first big pay day of his career. But three weeks into free agency, he’s still waiting for a mega-offer to come his way. In a league where teams are so starved for quarterback play that they’re willing to give a guy with seven career starts a contract totaling $72 million, it speaks volumes that no one is lining up to give Fitzpatrick an annual salary in the range of the game’s elite passers. That’s because it’s a pretty safe bet that 2015 was the aberration, given that there are 10 other seasons during his career that suggest the Harvard grad is nowhere near a top-flight QB. During his stops in six NFL cities, Fitzpatrick has compiled a 43-61-1 career record. He’s also never led his team to the postseason, although he got the Jets close last year, before throwing three fourth-quarter interceptions in season-ending loss to the Bills. If he leaves New York, the quarterback will be playing for his fifth team in five years; that’s not exactly a ringing endorsement. Although, this vagabond career is better than the one posted by Josh McCown, another laughable option that some people have suggested in recent days for Denver. Of course, that leads to the question or whether some experience – even if most of it is of the negative variety – is better than none. That would be the case if the Broncos decided to make a bold move on draft day and traded up to get one of the best quarterbacks coming out of college this year. They’d most likely have to get into the top 10 in order to grab the most “pro-ready” prospects, as most experts project both Carson Wentz and Jared Goff to go off the board early. Denver might be able to maneuver a bit to get Paxton Lynch, as he’s projected to go in the late first round, or they could be patient and take a chance on a guy like Dak Prescott. Regardless, it would be silly to turn over the reins of a championship-caliber team to a guy who was playing at North Dakota State, Cal, Memphis or Mississippi State last year. 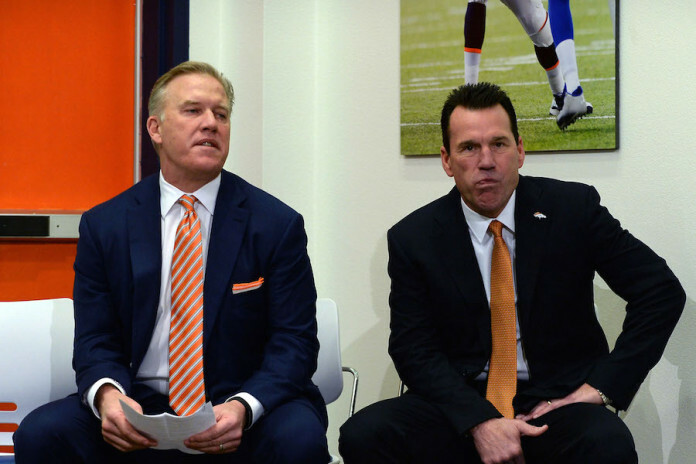 The Broncos have already tried that experiment at one point in franchise history – sort of. Back in 1999, Mike Shanahan put Brian Griese in charge of a squad that was coming off of back-to-back titles, replacing Elway with a guy who had thrown three career passes for a grand total of two yards; the Broncos, despite being loaded with talent, went 6-10 that season. Which leaves only one remaining option, the player who is clearly the best fit in Denver: Kaepernick. Of course, he’s a little trickier to get into town, as Elway will have to find a way to acquire him from the 49ers, but it’s doable; the quarterback’s relationship with almost everyone in San Francisco is strained to the point of no return. 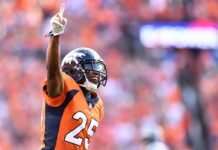 So the Broncos are simply biding their time, waiting for the price to come down before they make their move; it’s one that almost has to happen. Why? Because Kaepernick is the only quarterback in the conversation who has proven that he can play at an elite level in the NFL. Sure, he’s struggled the past two seasons, but that has more to do with the fact that he was playing for an organization that thought it was a good idea to run Jim Harbaugh out of town and replace him with Jim Tomsula; that’s not exactly an environment conducive to success. When he was a part of a talented team, one led by a head coach who knew what he was doing, Kaepernick enjoyed a ton of success. In just his second NFL season, he led the Niners to the Super Bowl, where they came within five yards of knocking off the Ravens. The following year, he ventured into Seattle and almost beat a Seahawks team on their home field that two weeks later would show the world, and particularly the Broncos, that they were pretty formidable. But it wasn’t just a few flashes. During his career, Kaepernick has posted a 27-20 record, plus a 4-2 mark in the postseason, while throwing for 56 touchdowns to only 26 interceptions; he’s also rushed for 11 scores, including an electrifying 90-yard scamper against the Chargers on Thanksgiving night in 2014. 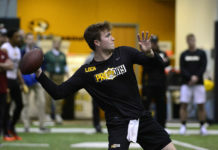 He’s got a rocket for an arm, is one of the best running QBs in the game and has shown great poise in pressure situations. None of the other currently available quarterbacks possess anywhere near the skills that Kaepernick brings to the table. And at only 28 years old, there’s still plenty of potential for the Broncos to tap into. All of this showcases why the debate that has raged in Denver the past three weeks has been so comical. There are actually people who believe a mistake-prone QB who defines mediocrity is the way to go. Others would choose a guy who continually gets bounced from teams after just one season. And those who haven’t learned from history have the gall to suggest that a rookie could get the job done with the Broncos. These options are boring, laughable and foolish, especially considering that a much better choice is there for the taking. Colin Kaepernick needs to be the Broncos quarterback next season. He’s clearly, without question, the best man for the job.